Men’s fashions in general don’t change that much, but there are some differences. Many men today prefer boxers over briefs. In 1962 it was the other way around. Men today don’t often wear hats, but they were fairly common in 1962. And some styles have changed a bit. 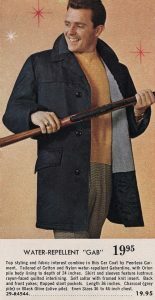 In any event, here’s a look at some winter fashions for men from the 1962 Eaton’s Christmas Catalogue. The three winter coats above range from $18.50 for the car coat to $29.95 for the stroller coat. In today’s dollar, the coats, from left to right, would cost $242.60, $149.85 and $161.60. Similar coats today are a lot less though you can find high end stuff in this price range and up. What I find most interesting though is how political correctness has changed what are shown in ads. The guy in the middle would probably not be smoking a pipe in a modern catalogue. And the fellow on the right certainly wouldn’t casually be carrying a rifle unless it was in a catalogue for Cabela’s or other specialty shop. 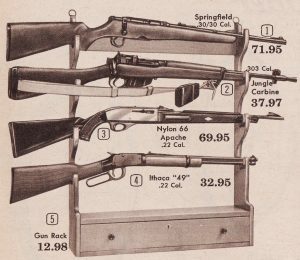 The 1962 Eaton’s Christmas catalogue actually had rifles for sale. The 30/30 at the top sold for $71.95, which in today’s dollar would be $582.80. The .22 rifle at $32.95 would be $266.90. At Cabela’s today you can get a Savage .22 with scope for $199.99. A Remington in various calibres all sell for $399.99 including the Springfield .30-06. You can get more expensive rifles as well. 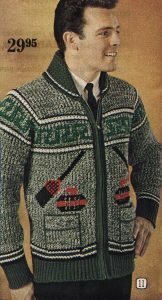 But back to men’s winter wear. Look at these sweaters. At $10.95 and $12.95, they would run to $88.70 and $104.90 today. Both are all wool. The curling sweater on the right is a bulky-knit Orlon. At $29.95, that would set you back $242.60 in today’s dollar. The most expensive sweater on Sears website is $39.99 (marked down from $79.99). 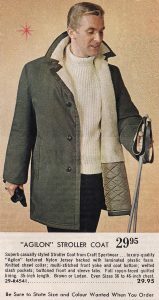 The cheapest is an Arnold Palmer men’s knit turtleneck at $8.94, marked down from $17.94. 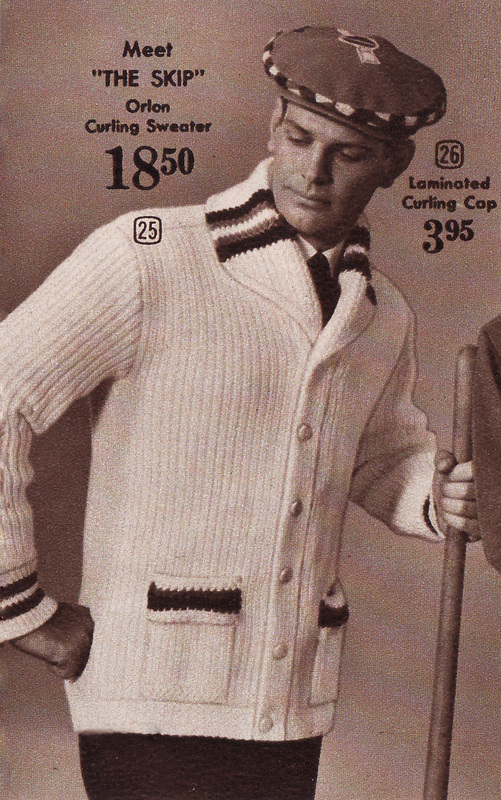 The lowest priced sweater in the 1962 Eaton’s Christmas catalogue was $2.50 or $20.25 in today’s dollar. Nice thermal gloves made from sheepskin went for $2.99 and up. The ones at left are $3.98 or $24.14 today. 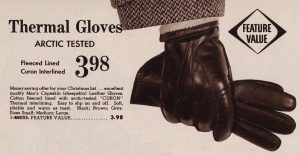 Sears had little in the way of gloves – a leather pair at $10.94 and a knit mittens at $14.94. Cabela’s had eight different styles of men’s cold weather gloves under $24.14. It had another 83 styles ranging up to $149.99. We’re working our way down the layers – coats to sweaters and now to shirts. 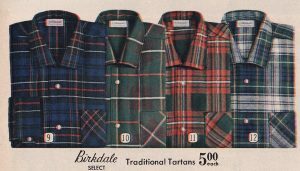 It’s a winter catalogue so flannel shirts please! At $5 each, these shirts in today’s dollar are $40.50 each. Flannel shirts from Arnold Palmer at Sears run from $14.94 to $35.94. And finally underwear. 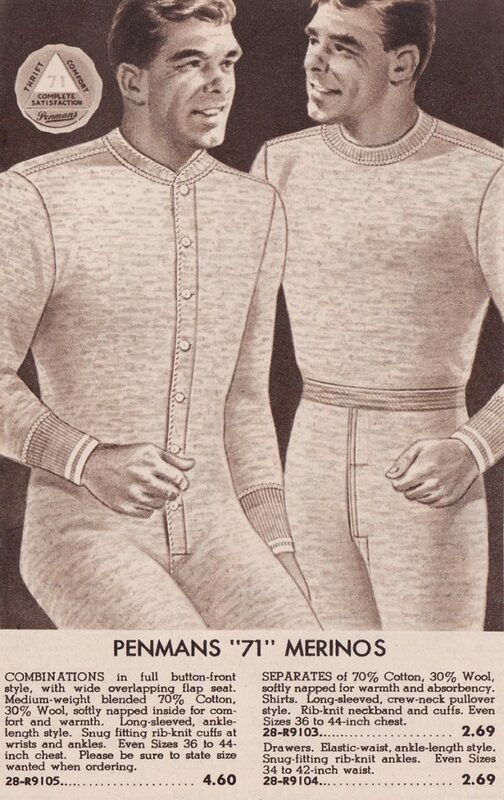 The long underwear shown above ranged from $2.69 for separates and $4.60 for a onesie. That would be $37.26 in today’s dollar. Yep! It had a flap in the back for when you had to use the toilet! You’ll find the full pages these items came from and more here: Page 4, 5, 6, 84, 85, 86, 87, 88, 89, 92, 93, 98, 99, 102, 103.